So you want to go to space but have no chance in hell of ever being able to afford it? Well, do not despair, for one company, in an effort to massively boost their sales, is holding a contest where twenty-two lucky winners will be able to jump onboard a shuttle and take a ride into sub-orbit. The company is AXE - the guys who make deodorant or body spray or something like that. What they make is unimportant, of course, since it matters little what you smell like when you’re in freakin’ space. 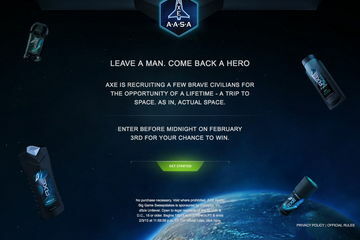 They’re calling it the AXE Apollo Space Academy and, should you end up a winner, you’ll take a ride as the second on a two-man, sub-orbital craft built by XCOR Aerospace and driven by the folks at Space Expedition Curacao. Considering that the normal price-tag of one of these journeys runs about $100,000, it’s a nice way to save some cash if you happen to be one of the lucky ones. But luck isn’t’ everything when it comes to securing your place. In order to win the contest, contestants must write an essay explaining why they happen to be the best people to take the flight. From there, people will vote online to determine the best essays. The chosen ones will take a trip to AXE Global Space Camp where a series of competitive events will weed out the best twenty-two. The final winners will train for three days and then, when the tourism company begins sending its ships up in 2014, take their ride. But the deadline fast approaches for this little venture. If you want to take a shot at the free ticket, you’ve got to submit your entry by February 3rd. Of course, don’t hold your breath on winning. Even if you write the best essay in the world, you’ll likely be competing against a million or so other people. Still, it might be a worth a try considering the sheer awesomeness of the prize.